Alberto Patishtan has become one of the most recognizable political prisoners in Mexico. His story is both exceptional and, unfortunately, all too common. Protests swept across Latin America, Europe and the United States in September to demand the release of Mexican political prisoner Alberto Patishtan Gomez after a Chiapas court rejected his legal challenge and upheld his 60-year sentence. In New York City, people protested outside the Mexican Consulate to demand the “immediate and unconditional” liberation of Patishtan. Similar protests were held in Barcelona, ​​Paris, Madrid, Buenos Aires, Bogotá and several cities in Mexico, including in Veracruz, San Cristobal de las Casas, Mexico City and Cuernavaca. More than 16,000 people have signed Amnesty International’s letter demanding freedom for the Tzotzil teacher, while in Mexico City, a group of activist and organizations formed the Committee for Freedom for Patishtan. Since his imprisonment began 13 years ago, Patishtan has become one of the most recognizable political prisoners in Mexico — not only because no one outside the Mexican justice system believes he is guilty, but also because of his ongoing efforts to promote human rights from within prison. His story is both exceptional and, unfortunately, all too common. Patishtan comes from the town of El Bosque, situated in the high mountains in Chiapas, a southeastern state of Mexico that borders Guatemala. He is indigenous maya Tsotsil. Since his imprisonment, he has focused on defending the rights of fellow indigenous people in prison, who often find themselves unjustly imprisoned for not being able to speak Spanish and not having access to a translator during trials. Known to his friends as “El Profe,” a nickname for teacher, Patishtan was already a community organizer before being imprisoned. Many contend that it was for this crime — that of challenging the established power structures — that he must face the rest of his days in prison, rather than the official alleged crime of murdering seven police officers. “This struggle started about 13 years ago,” Patishtan explained a few weeks ago from the patio of his prison cell. He appeared surprisingly optimistic for having just learned, only a few days earlier, that the Chiapas state tribunal had decided to reject his arguments. “This blow gives us more energy to re-double our attack,” he said. “I have to continue the path I’m on. My mission is to fight for justice and liberty of all who deserve it.” His legal defeat wasn’t the only bad news; he’d recently learned that benign tumors had returned, despite a previous operation. In 2000, Patishtan was accused of murdering seven policeman in an ambush on July 12, 2000, near the town of El Bosque. One survivor of the attacks identified him as the attacker, while another stated that the attackers were hooded and therefore he couldn’t identify anyone’s faces. From the day of Patishtan’s arrest until now, his case has been filled with irregularities and contradictions. According to multiple testimonies and official documents submitted during the trial, Patishtan was attending a work meeting with other rural teachers during the time of the ambush. But this alibi didn’t help his case, and further evidence — such as the fact that one of the witness testimonies was taken when medical records show the man to have been unconscious — wasn’t accepted. In fact, the procedural irregularities in Patishtan’s case began as early as his arrest and detention, seven days after the homicides occurred, although there was no warrant. After two years of trial proceedings, the Tsotsil professor was sentenced to 60 years in prison on March 18, 2002. He has appealed multiple times without success. His only other options would be to seek a declaration of amnesty, appeal for a humanitarian release due to his brain tumor, or to appeal to international courts such as the Inter-American Human Rights Court. Before being incarcerated, Patishtan belonged to the National Coordinator of Education Workers and he led the Society of Social Solidarity, through which he organized educational activities and democratic community processes. He was also a leader in the town’s ejido organization. In Mexico, ejidos are communally owned agricultural lands, where each community member holds his or her own parcel. The state of Chiapas is famous for being the birthplace and stronghold of the Zapatista movement. In response, the government has, for decades, waged low-intensity war to get rid of Zapatista insurgents and intimidate the local population that acts as their base of support. Usually this counter-insurgency consists of arrests, but sometimes the government extends even further. In June of 1998, two years before the ambush, there was a confrontation in El Bosque between Zapatista supporters and a group of police that resulted in the deaths of eight civilians and one policeman. An additional 53 people were detained — some were also subjected to torture. While not affiliated with the Zapatistas, Patishtan’s community organizing often put him at odds with the region’s corrupt municipal mayor, and he frequently denounced the injustices of the local government. A month before the ambush, Patishtan organized a meeting that brought together representatives from 12 neighborhoods, as well as two ejido and communal commissaries, to publicly denounce the local government’s lack of transparency, poor management of resources and abuses of power. Their next action was to send a letter to the state governor demanding that the local mayor be fired for abuse and nepotism. But the state governor didn’t fire the mayor. Instead, according to Patishtan’s colleague Ramírez López, the official instructed federal police to begin following community leaders. Two days later, the ambush took place. Seven days after that, Patishtan was detained. Across the world, how many political prisoners are behind bars for a crime that they did not commit? How many began organizing from inside prison, convinced that this was the only way to get justice? How many were freed? How many continue behind bars? Patishtan is one of many political prisoners who have sparked international movements for liberation. In the United States, now University of California philosophy professor Angela Davis was imprisoned and accused of murder and kidnapping for her affiliation with the Black Panthers and the United States Communist Party. The campaign for her freedom rocked the world, and the outcry led to her ultimate release. Yet others aren’t as lucky. Oscar López Rivera, who recently turned 70 behind bars, has been imprisoned for 32 years for fighting for Puerto Rico’s independence, while celebrated journalist Mumia Abu-Jamal has also spent more than three decades behind bar for his affiliation with the Black Power movement. And what about the imprisonment of those at Guantanamo Bay? In 2011, government cables leaked by WikiLeaks revealed that the United States was holding hundreds of people it knew to be innocent or not serious threats. Many more of those at the infamous prison have been detained under false accusations or those obtained under torture. And what about the Palestinian political prisoners locked up in Israeli prisons for the crime of nonviolent organizing and mobilizing in opposition to the occupation? Patishtan is only one of so many political prisoners incarcerated around the world. And like so many of them, from a prison cell in Chiapas, he continues to fight for his freedom. In 2006, Patishtan returned to organizing — this time from behind bars. 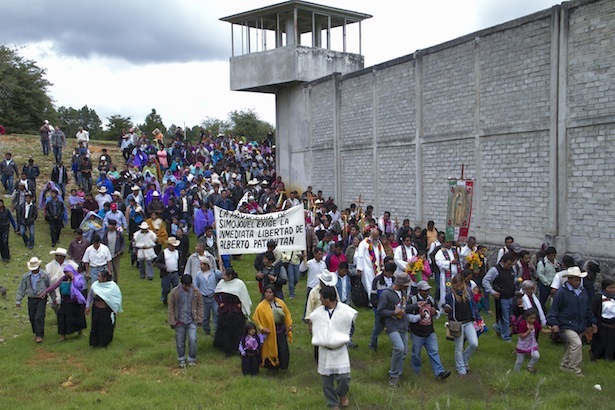 He and other political prisoners from Chiapas started the group La Voz Del Amate, named after the prison in which they were held. That year he also became an adherent of the Zapatista Sixth Declaration of Lacandon Jungle. On February 25, 2008, members of La Voz launched a hunger strike that lasted 41 days and won freedom for all the members of La Voz except for Patishtan. Instead, he was transferred to the maximum-security prison in the nearby town of Copainalá. When Patishtan returned to the El Amate prison, he was the only member of La Voz remaining. He requested to be transferred to a prison in San Cristóbal de Las Casas, where he began the organization Solidarios con La Voz del Amate. The group taught Spanish to indigenous prisoners in order to help them advocate against abuse, both in prison and in courtrooms. One of his pupils was 32-year-old Pedro López Jiménez who worked as a street vendor in Tenejapa, Chiapas, before being imprisoned. Patishtan inspired López to study international humanitarian law and work to promote human rights in prison. When Patishtan’s glaucoma kept him from seeing and writing, López became his secretary before being released recently. “Alberto is my inspiration and my teacher, and I want to follow in his steps and teach others,” he said. That group of 12 Solidarios supported incarcerated people, particularly those who were indigenous or whose due process rights had been violated. In September 2011, he and members of the solidarity group launched a month-long hunger strike to demand their freedom. “You lose your fear of death because you know you are fighting for justice,” Patishtan said. He explains that carrying out acts of resistance that could cost one’s life requires both preparation inside the prison as well as support groups on the outside. And it requires internal preparation. “It should be love that moves you [to strike], and not anger,” he explained. Unlike the first hunger strike — which won members of the group their freedom — this second strike was punished harshly. Three weeks into the strike, Patishtan was forcibly transferred to a maximum-security prison in the northwest state of Sinaloa, more than a thousand miles from Chiapas. Patishtan is now back in a prison in his home state, where the organizing for his freedom continues on both sides of the prison bars. While nine of the Solidarios were freed this summer, Patishtan remains with three fellow organizers. 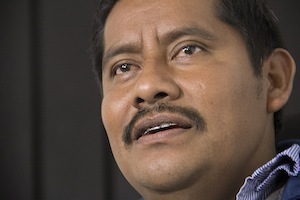 On the outside, his outspoken denouncement of the judicial system has inspired many in Mexican civil society, including his two children, 22-year-old Gaby and 17-year-old Hector, to become activists and organize for his freedom and that of other political prisoners. This article was translated from the original Spanish by Lela Singh. Correction: An original version of this article stated that Patishtan’s most recent tumors were cancerous. They are benign.